Guest Bathroom Mini-Makeover: It’s Finished! This is what the bathroom looked like before we bought the house and then right before we started the project. We didn’t do much to it except add some color with towels and a shower curtain. We briefly considered a major renovation, but in the end, we decided we would rather spend that money on our master bathroom. I had originally planned to paint the pinky-beige wall tile but decided against it, so the plan evolved from there. My original selections still worked, but I needed to find a paint color that would coordinate with the tile and make it, hopefully, disappear. The best choice for the walls ended up being Benjamin Moore Alphano Beige 989, and I selected a shade three shades darker for the vanity Ticonderoga Taupe 992. Keegan and I demoed everything that wasn’t staying – countertop, medicine cabinet, toilet, hardware. And, we had a spirited debate about those horrible shower doors. I was dying to rip them right off, but he didn’t agree. The next morning, he told me I could go ahead if I wanted to, and so I disassembled them and got them out to the curb right just as the Bagster was being hauled away. It was so satisfying to see them gone even though we were left with a little damage to the shower liner that needs addressing. This is a bad phone photo I took after they were removed and I cleaned up the tub. You can see the paint swatches on the wall above the tile. After I painted the walls and trim the lighter shade in an eggshell finish and got a base coat on the vanity, it was time to install the floor. I chose a peel and stick vinyl from Home Depot that resembles Carrera marble. It was my first time installing this type of product, and I thought it was really easy. The whole thing took about 4 hours, and it made the biggest difference to the space by far. I do not miss the hideous stained peach vinyl at all! If you look back through the vanity, you can see the hideous wallpaper/paneling that was originally used in this room. It was all over the house in various patterns and textures. After the flooring, it was time to bring everything else back into the space. We ran into a little snag with the faucet and had to call a plumber who also set the toilet for us. It was well worth the extra expense to have a professional handle the plumbing. Here is what the bathroom looks like now. We have some minor items to address, but it’s fully functional and looks so much better than it did before. My favorite changes are the new floor and the new sink and faucet. I did make some changes to my original plan in order to stay on budget. I selected a cultured marble sink and countertop from Lowe’s because I liked it better than the quartz when I saw them together in person. The knobs on the linen closet are from World Market instead of Anthropologie, and the toilet is a one-piece model from American Standard that we got at Lowe’s. When I saw it on the shelf at the same price as the one I planned to order online, I couldn’t resist the idea of not having to clean around the traps anymore. The towels, rug and soap dispenser are all from Target. I did struggle to decide on which accent color to bring in, but I really love the pops of orange and yellow. I wish it were possible to get a photo without the light on so that you could see it better, but this room is pitch black without it. The photos are a little blurry from the lack of light, but they’re fairly accurate in terms of color. I was able to visit Anthropologie in person twice on my trip to the East Coast – in Montreal and Baltimore – and fell in love with these brass and mother of pearl knobs. I ordered two more for the linen cabinet, but I preferred the look of the dark bronze on the lighter paint color instead. Overall, this was a fun project and well worth the time and effort. Even with the $287 for the plumber, we came in right on budget at around $1750. The space is much more pleasant to use, and I no longer cringe when we have guests ask to use the restroom. I still have some little things to do like figure out how to reattach a portion of the shower liner and replace the shelves inside the medicine cabinet, but for now, I’m pretty happy with the results. Just discovered your blog while looking for paint color ideas. 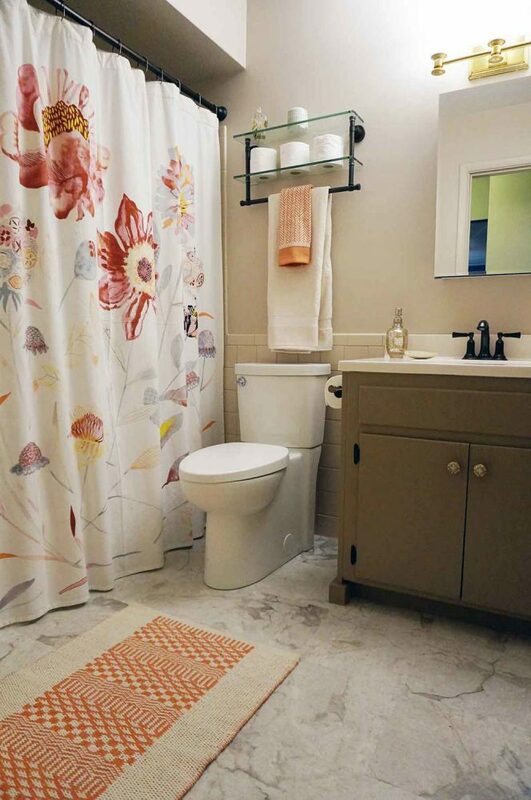 Nice job on this guest bath! The floor tiles look very nice, who would have thought? Can you tell what’s behind that shower liner? In a house of that era, it was probably originally tile – if you take it down, I hope it’s feasible to find a tile that coordinates with the other 4 x 4s instead of replacing it with another acrylic shower liner. Thanks! I’m actually terrified to mess around with that liner any more than I already have. It’s peeling up on one side. I wish I could get it off because the color is disgusting, and I think the pink tiles would look cute if I repainted the walls white. In reality, the entire room really needs to be gutted. Hopefully, that will be up to the next owners!